Once we got there, we just headed to the doctor's office for a quick visit -- he was pretty cool and very inviting. He explained things very well and Julia got comfortable really quick after a few minutes of silence from her as she does with strangers. Next thing we know she's exploring the doctor's office and playing with the cabinets and walking around. She was a little grumpy because we had to get up early to make most of the day, but that quickly went away after a few minutes in the doctor's office. 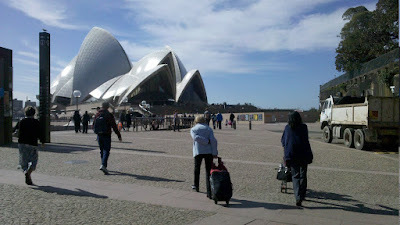 Then there was the Sydney Opera House. The view was magnificent from the wharfs and the nearby park. We had Hungry Jack's for lunch which is basically Burger King with a different name. We had good fun with the birds at the park too before we headed off to see the Opera House up close and personal and from the inside. 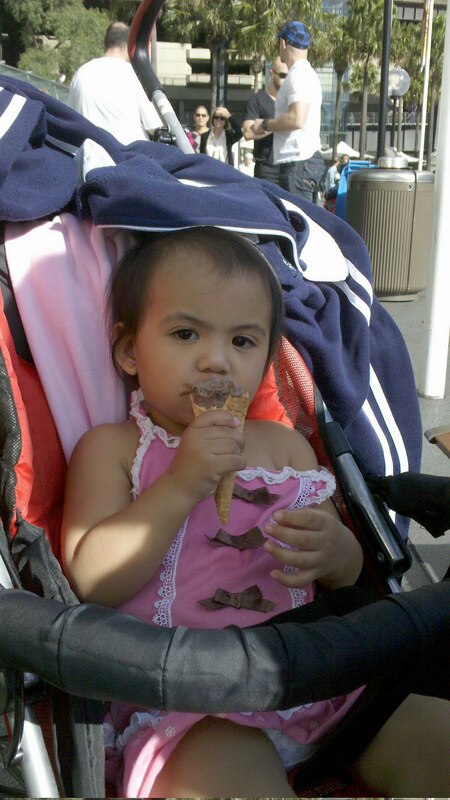 Julia had so much fun outside the Opera House that she could hardly contain her enthusiasm! That was loads of fun. Afterwards we all then had Ice Cream, which Julia thoroughly enjoyed. If every weekend would be this much fun I can understand why the Sydney-siders have the most awesome attitudes of all the people I've been around in the world.